I promised in my last favorite post that this would not be devoted to just running gadgets. As you probably know by now, I have lost over 92 lbs. this year. I lost most of my weight by changing my eating habits. I eat clean, mostly organic real food. This means that I cut a lot of processed foods out of my diet. I eat whole grains, fresh veggies and fruit and lead meats. I have found so many blogs and resources this year of other people who have made this transition into healthy living. 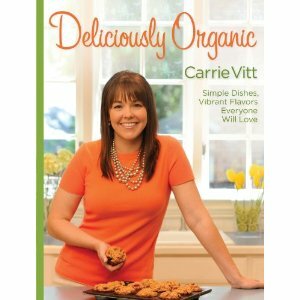 And that is why I was so excited to find Carrie Vitt's cookbook. She keeps a blog called Deliciously Organic and she loves good food. Her cookbook is proof that healthy food can taste good! Here ingredients are simple, but all come together for the most delicious tastes and flavors. Any recipe that I have tried has been a huge hit for the men in my household. This cookbook is at the top of my list of recommendation for people looking to make changes in their diets and start their healthy living lifestyle. I promise you, you will not be disappointed!